Sunday morning I got up before daylight and took my new White’s Beach Hunter ID 300 to the river. 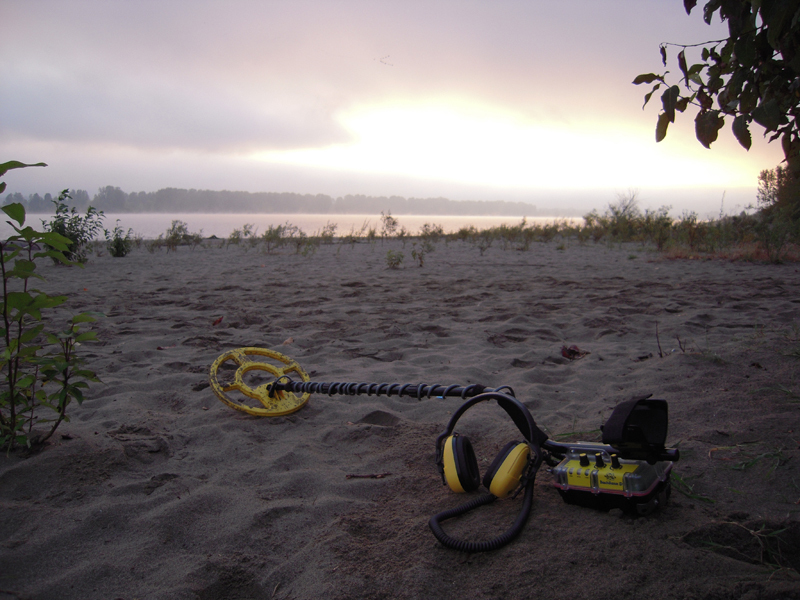 I wanted to spend another day in the sand/water and also needed to put in some hours learning this new detector. I arrived at the river just at daylight and it was a beautiful sight. A layer of fog blanketed the area and the sun was trying to push through. It was awfully cold so I spent the first couple of hours in the sand trying to find some coins & jewelry. Unfortunately all I got for my trouble was a massive number of bottle caps and a few clad coins. Later when the sun came out I put on my water shoes and began to cover the sandy shallows. I didn’t want to get out too far because this river is deep, swift and known to claim swimmers every year. This particular beach is one of the few that has a flat beach before it drops off. The BH was working great and I found it easier to run in all-metal mode and then just watch the indicator lights. I skipped the red light signals (iron) but dug everything else. As you can imagine, I dug lots of bottle caps and pulltabs with my sand scoop. I was standing in thigh deep water and one particular signal was strong and loud (just like bottle caps) so I didn’t think much of it. I dug it, shook the scoop underwater to clear the sand and found this large gold ring waiting for me. To say that I was excited might be putting it mildly and I think I did do the happy dance. I’m sure the people on the beach thought I was crazy to be out in the river in the first place (no wetsuit and it was cold). I’m stumped on this ring because there is no visible stamp. It looks and feels like gold but without a gold tester I have no way of knowing. Looks like I might need to buy a tester. My wife looked at it and she thinks there is a rectangular stamp on the inside of the band but it has worn off. Anyway – I’m extremely excited to have found my first ring in the water. This is really, really fun! I went out for a 3 hour hunt Saturday morning at my favorite “small” park. I took my camera (with a full battery) this time. 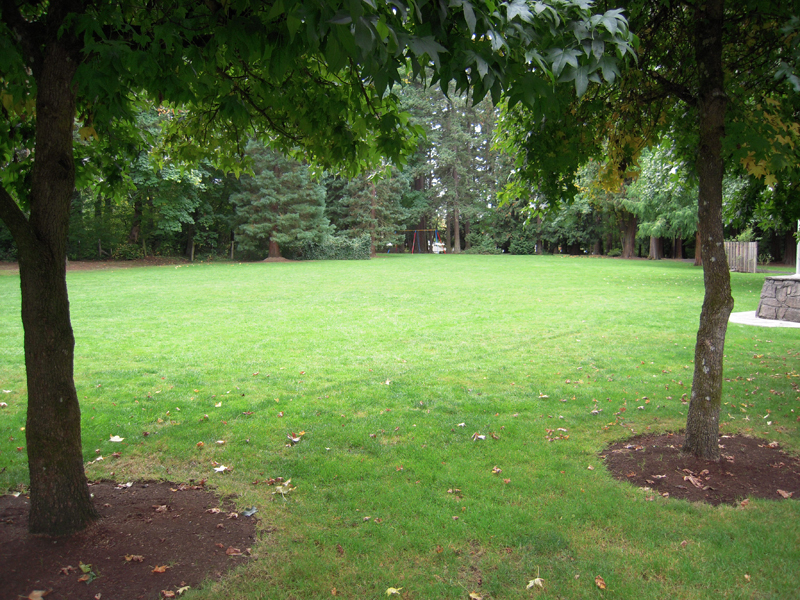 The first pic shows the grassy area that I’ve been covering. I was taking it real slow and digging pretty much everything. 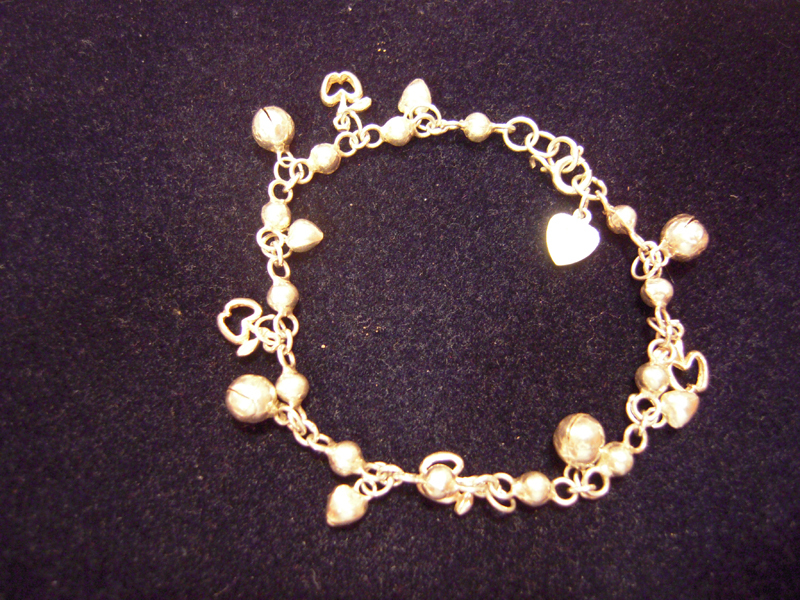 I managed to recover a handful of clad coins, several miscellaneous items, a mood ring (my 3rd one of these) and a 92.5 stamped silver charm bracelet. I also recovered and disposed of another handful of pulltabs and screw caps. I sometimes imagine what this earth would look like if the top 6 inches of soil were transparent. When I was almost done detecting, a lady that works at the community center at this park came over to me and tapped me on the shoulder. As I took my headphones off I was expecting her to ask me to leave. As it turns out, she had been watching me for awhile from inside the office. She told me she was very impressed with my target recovery speed and how I left no trace in the grass. She said other detectorists had been to this park and were very sloppy. I thanked her for the compliment and asked that she not judge all of us by the unfortunate behavior of certain individuals. However, the real reason that she came over (and why I’m telling you this) is that a lady had reported that she lost an expensive amethyst ring there the previous weekend and it was apparently a significant emotional loss for her. She pointed to where the lady thought she lost it and asked me to try finding it. Well, I was almost ready to leave but I did spend about 15 minutes searching the expansive area but to no avail. I promised to come back and give it some serious effort as soon as possible. 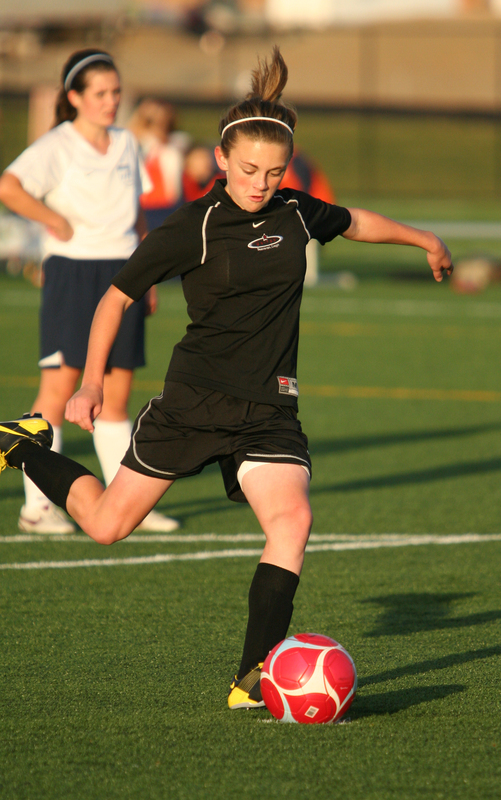 THUSC Sodium continues to tear it up in Girls U13 Fall League. After a tough battle for a tie with Oregon Rush 95 Girls last weekend, Sodium is currently ranked second. Standings from OYSA are listed below. Check out the Sodium Team Blog for more details: http://sodiumu13.blogspot.com/. I had a couple of hours Saturday morning so I headed back over to the small park that I found my last ring at. I was planning to cover more of the grass there that I wasn’t able to finish last time. However, when I arrived I noticed they had done some excavation at the park. On one end of the grass field they had scraped out a 30×40 foot section and piled the dirt around the perimeter. I know this park is old so I spent most of my two hours covering the scrape and dirt piles pretty thoroughly. I just knew there would be some old silver coins in those piles. Unfortunately all I found was a few clad coins and lots of screw caps. I believe this particular park was the place to drink beer judging by the sheer number of screwcaps I’ve found. Anyway, I had about 25 minutes left so I walked over to the playground and hit the wood chips for awhile. I wasn’t getting many hits so I think the playground equipment might have been added recently. As I came around the bottom of the slide my MXT got a solid 30 VDI hit. I kicked away the chips with my foot and saw this ring. 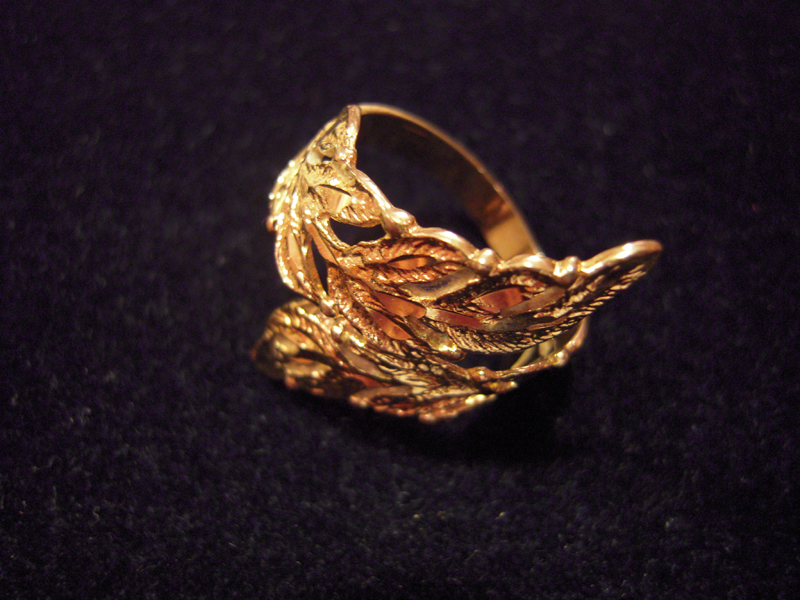 It is stamped 18k GP (gold plated) – so not valuable, but it was nice to get any ring on that short hunt. 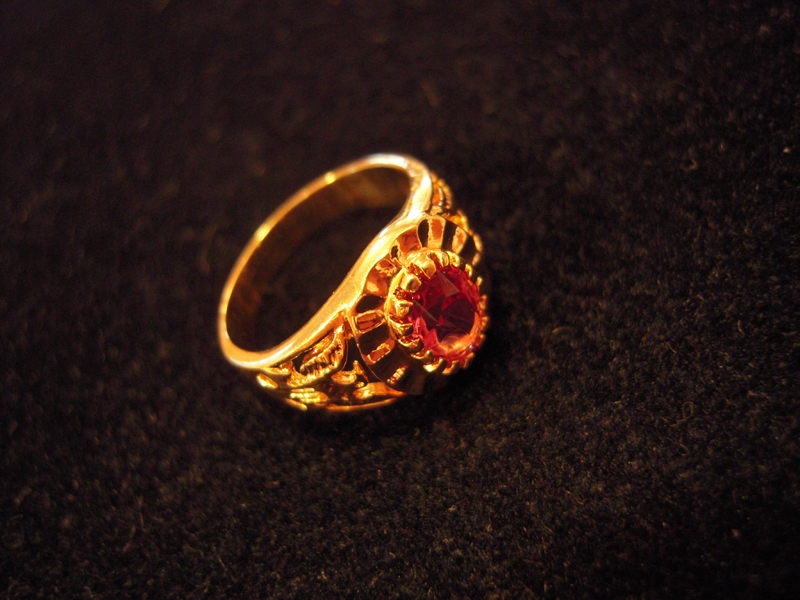 The pinkish stone is likely glass and the ring has eagles on each side. I’ll add it to my collection. After more than a year of training and several frustrating injuries, I finally completed my first marathon on Sunday. My 4:33:53 finishing time isn’t likely to impress anyone, but I’m savoring the accomplishment nonetheless. My average per-minute pace was 10:27 and I placed 3746 out of 7498. Not too bad for a first-timer with a knee injury. My status was questionable right up until the night before due to my sore knee. As I’ve documented on this blog – I acquired my sore knee on an 18 mile benchmark run many weeks ago and it has been slow to heal. 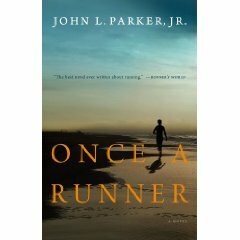 I was leery of running such a long distance with knee pain, but at the same time I would have been crushed to miss the Portland Marathon again this year. So, I showed up at the start line at 6:30am on Sunday morning. I stood in a long line to take my turn in the portable john. It was still kind of dark and cool but not cold. I wore an old white long sleeve t-shirt over my black Dri-Fit short sleeve running shirt. I ended up tossing the sleeves in mile 2 after I warmed up a little. I stepped into the sea of runners somewhere in the 3rd or 4th wave and waited for the starting horn. I had 2 GU gels (Espresso Love – naturally) and my Ipod Nano with exactly 4 hours and 30 minutes of music designed to keep me in “the zone”. I also tucked a $20 bill and my cell phone into my Ipod armband just in case I needed to be rescued somewhere along the course. The first 5 miles went fine with a short loop downtown and then up Front Avenue to Barbur Blvd and then back. From there the course took us out Front Avenue into the industrial sector with the turnaround point at mile 9. This area is not exactly “scenic” but there were lots of supporters along the course cheering and plenty of drink stations. As I recall, the first of several Gummi Bear stations was in this area as well. I’m normally not a big fan of Gummi Bears, but on this day I was tossing em’ down. 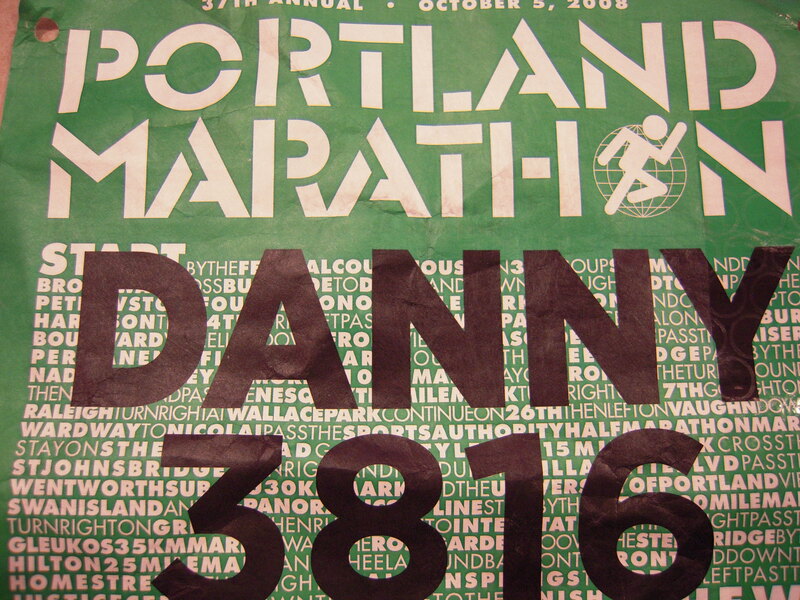 I have to say that putting my name ‘Danny” on my bib was a great idea. I lost count of how many times supporters yelled my name along with some encouraging words. I’m sure if you’ve ran a few marathons this type of support isn’t important – but I can tell you assuredly that it helped me. So, I smiled, waved and enjoyed the sites along the way. Aside from guys peeing behind trees and some girls peeing behind trucks, the scenery was interesting and kept my mind off my knee. At around mile 11 we left Front Avenue for a short tour of NW Portland which eventually dropped us onto St. Helens Road around mile 13. Now all had been going well up to this point. My knee was sore and achy but not causing any serious problems. I don’t know when I noticed but it had started raining and my shoes were pretty soaked at this point. I knew the blisters would come – but I couldn’t afford to think about anything negative. I recall dodging puddles and cussing the strong headwind on the long slog toward the St. Johns Bridge. I had been warned that you can see the bridge from the distance, but it is deceptively far away. You know, we’ve all heard the phrase “hitting the wall”, and honestly I’ve always wondered what that actually meant. Since this was my first marathon, I’ve never had the chance to experience this before. Well, all I can say is that it got ugly really quickly after passing the 18 mile point. I don’t think I really noticed how badly I felt for awhile, but at some point my face became permanently affixed with a grimace of pain and I started having thoughts of quitting. I recall thinking that the remaining 8 miles might as well have been 28 miles because there was no way I could do it either way. Willamette Blvd just happens to have a number of wide, flat speed bumps and each time I went over one – a jarring bolt of pain went up my legs. My mind had me convinced that every patch of wet, muddy grass along side the street would be as comfortable as my bed at home. I really, really wanted to just lay down for a couple of minutes. I’m pretty sure that I would have done that except stepping up onto the curb would have required some serious thought and effort on my part. Luckily I chose to keep running. I passed mile 19 and, although I was a complete zombie I kept plugging away. I still had enough sense to realize that if I just kept moving I would see another mile marker in 10-11 minutes. I also knew that the blisters on my feet were getting worse and there was nothing I could do about it. I applied lots of Body Glide and Vaseline before the race, but the wet shoes & socks eventually wore away my protection. At mile 20 there was a view of Portland’s industrial sector off to the right. It wasn’t much to look at but the change in scenery did help a bit. From there we passed the University of Portland campus and began a long downhill section that couldn’t have come at a better time for me. Basically it was coasting for half a mile and man did it feel good for awhile. Miles 22-23 took me under the freeway and then up an overpass before cruising by the Memorial Coliseum. A hard right turn put me on the Broadway bridge and I was headed back over the river. The course narrowed considerably on the bridge and for the first time since the start of the race – I was shoulder to shoulder with other runners. 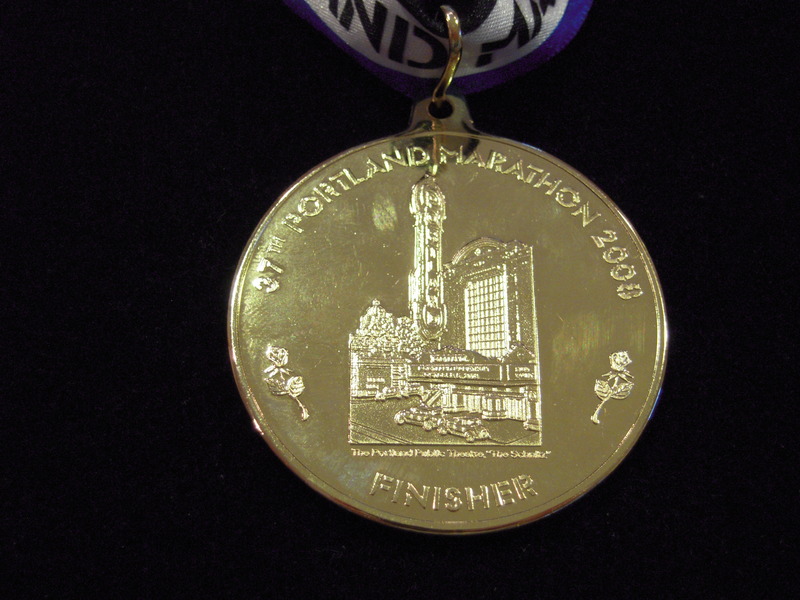 We circled around and headed south on Naito Pkwy toward the finish. At this point I was completely spent and beyond running on fumes – I was running on pure determination. I didn’t dare stop to walk as it would have been nearly impossible to start running again. I grabbed another cup of Gleukos and slowed down to drink it before making the final push to the finish. There were lots of supporters along the street now and hearing the cheers helped a lot. I focused on the pavement ahead of me and finally looked up to see the Salmon Street sign. It was such an amazing feeling knowing that I was about 3 blocks from the finish. 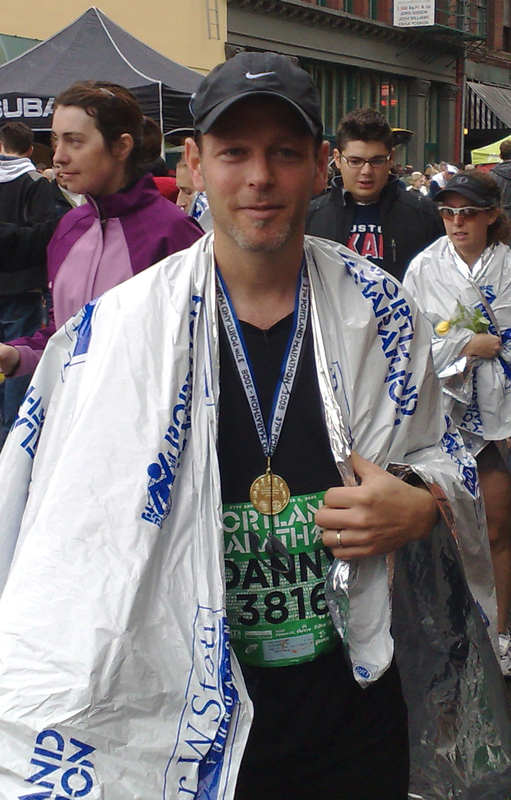 When I crossed the finish line they put a space blanket over my shoulders and pointed me toward the medals table. And, I kid you not, the last song on my Ipod play list – Comfortably Numb by Pink Floyd was playing as they hung my medal around my neck. I was having trouble standing on my own and I think someone pushed me toward the tables of food. In 5 minutes I had downed some apple and orange slices, grapes, string cheese, several cookies, carton of yoghurt, bag of chips and a bottle of chocolate milk. I felt sick after that. I found a chair to rest for awhile and then I managed to get through the t-shirt line and get my picture taken. As I stumbled through the crowd to the reunion area – a wave of emotion hit me. For the first time, I was able to focus on the accomplishment and not the pain. I just ran my very first marathon! Holy crap – I just ran 26.2 miles!